The Saunders and Cooke ring dial. The universal ring dial is a sundial with unparalleled elegance. Its clean lines are beautiful in their simplicity, yet this type of dial is probably the most useful of all the portable dials. It is completely self-orienting and requires no compass to use, you need only know your latitude and the time of year to use it, and it is more accurate than other types of suspended portable dials. I have been seeking a quality reproduction for some time and I was delighted to discover that Saunders and Cooke offer a detailed reproduction. The following review features photos of the first ring dial I received from Saunders and Cooke. I have since received a prompt replacement which is a much better sample. I will add photos when I have had a chance to polish it to a full luster. I have no connection with Saunders and Cook. What follows is strictly my personal opinion. If you are interested in a universal ring dial by all means order a Saunders and Cooke dial for yourself and form your own opinion. The dial features fine engraving and a snug fit between the inner and outer rings when folded. The engraving on the rings of my first sample was shallow and could not be detected by touch. The shallow engraving sometimes made the engraving hard to make out against the brush finished of the brass rings. An examination of the new ring dial reveals much deeper engraving. Although not quite as fine as the first dial’s engraving I feel the slightly coarser but deeper marking on the second ring dial is much more practical. Looking back to the first sample, there were some nicks and what appear to be marks from a vice used in construction of the ring. The rings of the new sample are vice-mark free and the finish is much is much finer. 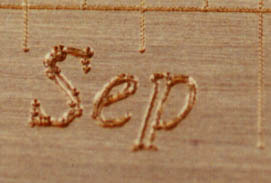 Engraving on bridge of first sample. The engraving on the bridge of the first sample is deeper and the brass is better finished but the engraver has left visible pits. The engraving on the new sample is much better. Right angle stops on first sample. 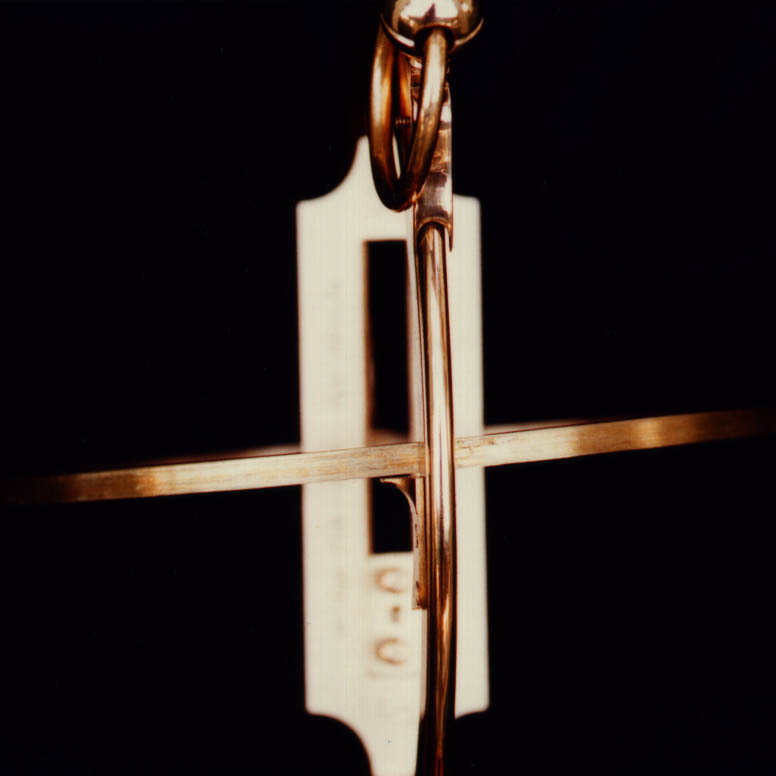 The right-angle stops which are supposed to hold the inner ring at a ninety degree angle when opened are misplaced and allow the ring to over-travel. This fault is found on both samples of the ring dial. This problem appears to be caused by the way the holes for the right-angle stop attachment screws are laid out. It seems that marks for where these holes should be drilled are laid as part of the overall machine engraving process without regard to the actual fit of the pieces. The error is consistent between both samples, so one might assume that the offset could be corrected in the engraving process or one could simply open the dial to 90 degrees, place the right-angle fitting against the rings and make a pencil or awl mark where the holes fall. Saunders and Cooke is no longer in business. The Ames Instrument Company’s universal ring dial is a small but functional, dial available that used to be available through dealers catering to historical reenactment. It is two-and-a-half inches in diameter and about nine sixty-fourths of an inch thick. Also included is a black leather pouch. The inner ring features an hour scale with ten minute divisions and opens to form a ninety degree angle with the outer ring. The hours are marked with roman numerals which are somewhat difficult to make out and are apparently acid etched. The outer ring is marked with a latitude scale in one degree increments witch also appear to be acid etched, although the Arabic numerals may be stamped. 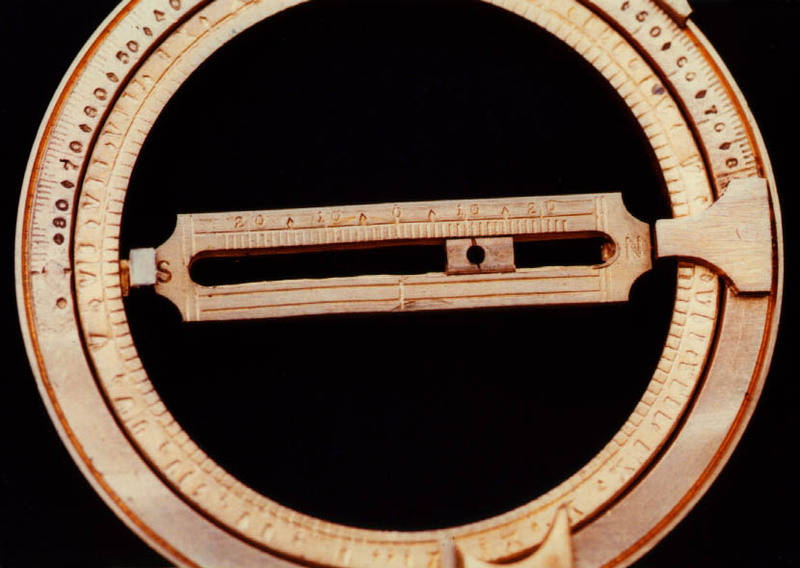 At the top of the dial is a suspension ring attached to a brass slider which the travels around the circumference of the dial in a pair of grooves allowing the dial’s suspension ring to be adjusted for any latitude. 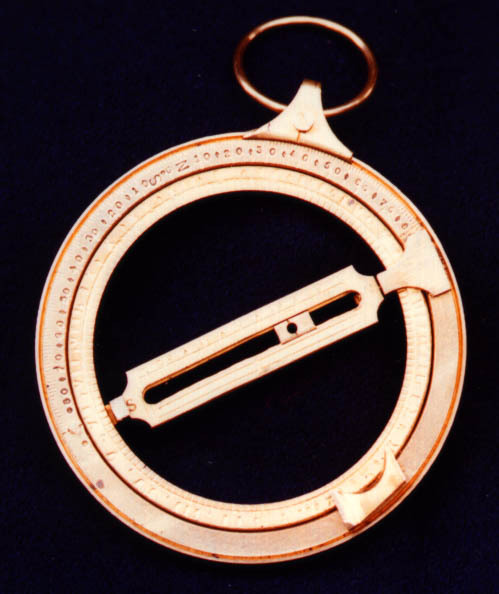 The bridge which runs through both rings is marked with a declination scale and there is a sliding cursor (gnomon) which can be set to the appropriate position for the current time of year. To use the dial you adjust the suspension ring slider to your latitude and slide the declination cursor to the correct declination for the time of year. (Roughly speaking, declination is how high the sun appears in the sky as measured from its average position. The sun is highest in the summer, lowest in the winter and in the middle during the two solstices. You will have to look up the declination in an almanac, for example). Open the dial and suspend it by its ring, then rotate the dial until a spot of sunlight falls through the hole in the cursor on the inner circumference of the inner ring. The hour scale tells you Local Apparent Time. The Ames Instrument Company’s universal ring dial’s chief recommendation is its reasonable cost and ease of availability. The dial is functional though somewhat workman like in appearance and finish. The small size makes the dial quite practical for carrying with you; however, the etching of the hour scale is a little hard to read. 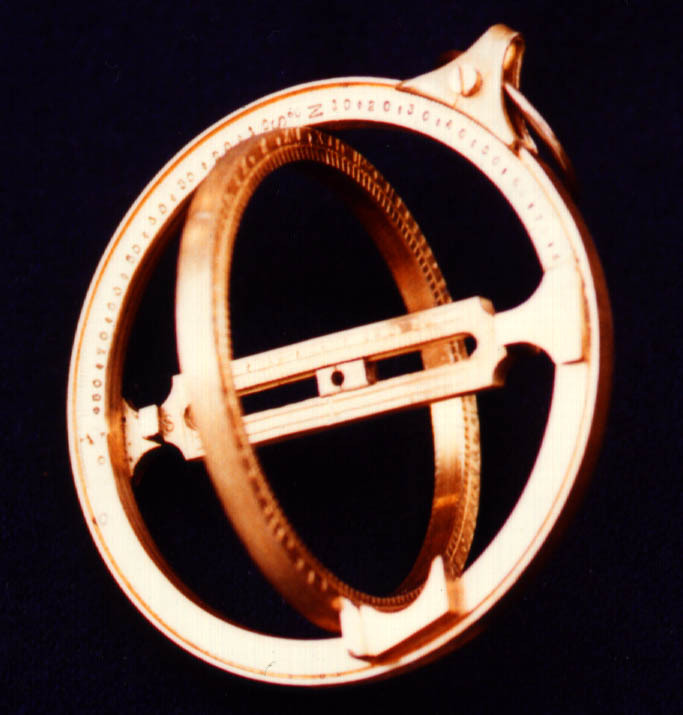 Additionally, the thickness of the brass rings actually makes it a bit difficult to use the dial in the days near the equinoxes and during the hours close to noon because the rings block the sunlight from shining through the hole in the declination cursor. I have no connection with Ames Instrument Company. My comments on this dial are strictly my personal opinion. If you are interested in a universal ring dial by all means see one of the models I have reviewed for yourself and form your own opinion. 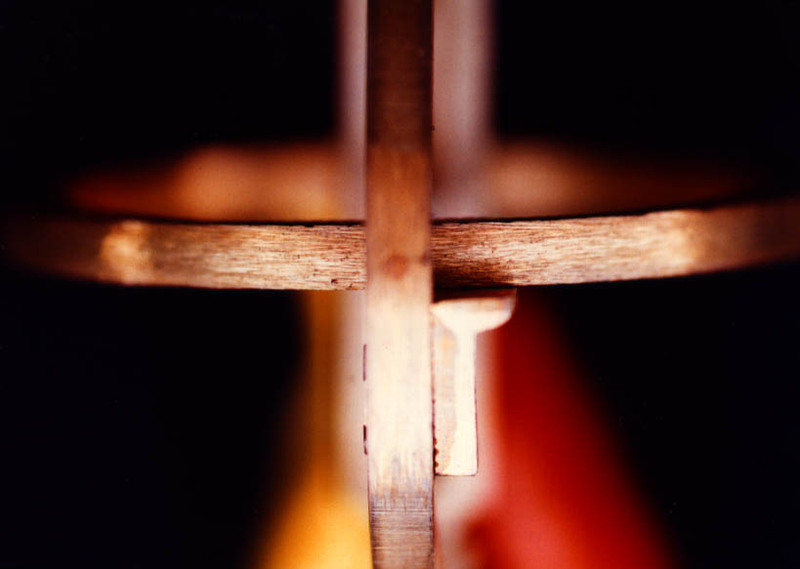 The Ames Instrument Company had a good looking new website in 1997 at www.amesinstrumentcompany.com, a site which is no longer registered (as of 2016).